The Miami Dolphins' secondary is thought to be an area of concern in 2013 and perhaps even more so when looking at the opposing quarterbacks the Dolphins will face this upcoming season. The schedule includes matchups against Andrew Luck, Matt Ryan, Drew Brees, Joe Flacco, Philip Rivers, Ben Roethlisberger and Tom Brady twice. While this looks to be cause for concern, the Dolphins have one of the league's best equalizers for a suspect secondary: defensive end Cameron Wake. 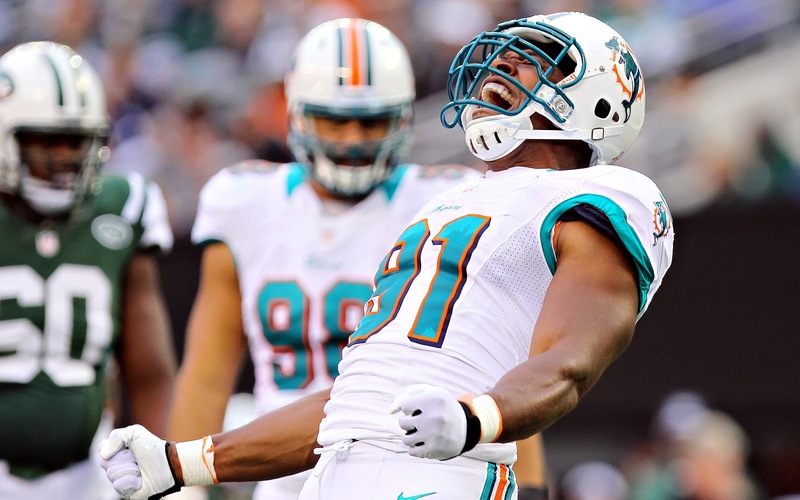 A former standout in the CFL, Wake has excelled since joining the Dolphins prior to the 2009 season. Last season, Wake recorded a career-high 15 sacks which ranked fourth in the entire NFL. For the Dolphins to make a playoff push, Wake will need to be as good this season. Wake has played in all 16 games in each of the last three seasons for Miami, has tallied 37.5 sacks over that span, and has been named to the Pro Bowl twice. Last season, Wake was recognized as a first-team All-Pro. Wake's value however cannot be measured in sack totals alone. Last season, Wake was tied with linebacker Koa Misi and departed cornerback Sean Smith for the team-lead with three forced fumbles. Wake also seems to have a knack for drawing flags against opposing tackles and in some cases, guards and tight ends that attempt to slow him down. Wake will draw his fair share of double-teams as well, which should open things up for Dion Jordan, Jared Odrick, Olivier Vernon or whoever plays at the opposite end position. Wake has shown to be a good defender against the run as well. Last season, Wake assisted on a career-high 15 tackles. Wake gives great effort, is a high-energy player and received praise from defensive coordinator Kevin Coyle recently. Coyle claimed that there isn't a player in the league that he would give Wake up for. Wake is not only one of the better defensive players in the NFL, but he will serve as a leader for Miami in 2013. With the Miami Dolphins facing a slew of elite quarterbacks this season, Cameron Wake will need to continue to be one of the NFL's premier pass rushers. Six of Miami's 16 games this season will be played against teams that ranked in the top 10 in passing a season ago. The Dolphins also have big questions in the secondary, but if Wake can continue to wreak havoc as a pass-rusher, the rest of the Miami defense will be able to breathe just a bit easier.